Any search for the roots of treacleware must first take into account just how many variations there are. The Treacleware label can be used to describe a huge variety of brown glazed wares. This is an area of study that requires considerably more investigation and research. 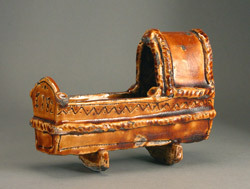 AP/310 Earthenware cradle covered with brown translucent glaze. Inscribed: “1782, M. A., J. A.”. Sgraffito decoration. English. If we take, as a basic starting point, a description of treacleware that includes any earthenware body that is decorated (either in part or in full) with a brown coloured glaze, then the history of treacleware goes back possibly thousands of years. Treacleware of a sort was made in Britain from at least as early as the sixteenth century. “English Pottery” by Julia E. Poole (1995), p.14-15, illustrates a beautiful example of an earthenware drinking pot with a treacleware type glaze and with silver mounts, dated circa 1545-1560 from the Fitzwilliam Museum collection. China is known to have produced treacleware type wares for many centuries. In fact it is certain that most ceramic producing nations have produced some kind of brown glazed earthenware at some point in their history. Any input from readers that could expand this section would be very helpful. For many years in Britain and elsewhere (mainly the US) it has often been assumed that treacleware was invented by the Swinton Pottery (Rockingham Works), in Yorkshire, England. This has much to do with the fact that the term Rockingham became synonymous with brown glazed earthenware (treacleware) during the 2nd quarter of the C19th. The reason for this was that the Swinton pottery was built on land owned by the Marquis of Rockingham who became a patron of the pottery and introduced many influential customers, including royalty. The pottery produced a refined, manganese based purple brown glaze, which it used on a limited range of forms including cadogans, jugs and teapots, often further decorated with gold gilding. These wares became surprisingly popular and for a while attracted very high prices. This in turn led to considerable competition from other potteries. The term ‘Rockingham glazed’ or ‘Rockingham ware’ became widespread terms to describe manganese based purple tinted treacleware (the Swinton pottery itself actually referred to these as ‘purple teapots’ in the early years of production) [Ref. to follow]. What is often overlooked, is that the Swinton pottery merely improved and refined the already existing brown glazed earthenware. The use of manganese to produce purple brown goes back a long way before it was employed at Swinton, it can be seen in the tortoiseshell wares of Whieldon in the mid C18th and in the mottled manganese wares that resemble Staffordshire slip ware that preceded them (and many other examples).Treacleware was immensely popular in Britain throughout the C19th, it was produced in a vast number of different potting centers from the smallest country pottery right up to the giants of Wedgwood, Minton, Spode and the like. Treacleware also became very popular in the USA from around the middle of the C19th onwards. This development was partly kick-started by the input of British potters who took their skills and knowledge over from Staffordshire to the United States. The most famous American pottery as regards treacleware production was the Bennington pottery in Vermont. Although a huge proportion of their output was simply a direct copy of British originals, they did impart a distinctly American quality to their wares and introduced further refinements such as Flint Enamel ware (basically treacleware but with colouring from metal oxides and very similar to majolica ware). The Bennington Pottery did produce simple one colour treacleware but the vast majority was apparently flint enamel ware in a huge range of colour variations (see ‘Bennington Pottery And Porcelain, A Guide to Identification’, by Richard Carter Barret (1958) for more details). 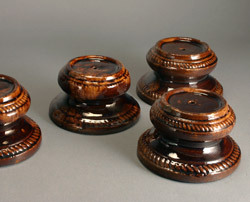 Set of 4 round two-tone treacleware furniture rests, British, circa 1870-1890.